SendGridSendGrid, which went public in November 2017 with a market cap around $US725 million, will soon join Twilio at valuation around $US2 billion. Twilio’s acquisition, which is all-stock, values SendGrid around $US2 billion. That’s a premium over the $US1.43 billion at which SendGrid was valued at the closing bell. Twilio, the $US7.4 billion company that helps apps and websites send texts and make calls, is acquiring SendGrid in an all stock deal valued around $US2 billion. The transaction, which was announced Monday, is expected to close in the first half of 2019. SendGrid, which is based in Denver, sells an email marketing platform that enables its customers to send newsletters, marketing and email confirmations en masse. As of late last year, it sent around 36 billion emails a month on behalf of customers like Uber and Spotify. Indeed, SendGrid is a Twilio partner, helping their mutual customers keep in touch with users. The company went public in November 2017 and closed its first day of trading with a valuation around just $US725 million. 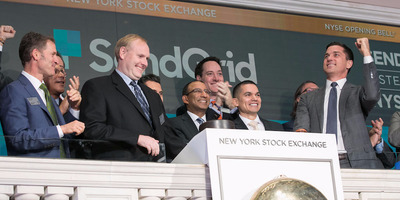 At the closing bell on Monday, SendGrid was valued at $US1.43 billion. In a letter to staff filed publicly on Monday, SendGrid CEO Sameer Dholakia confirmed that he will stay in his role, and that SendGrid will function as its own autonomous division of Twilio. Twilio CEO Jeff Lawson highlighted the importance of email tools like SendGrid in Twilio’s growth plan. “Increasingly, our customers are asking us to solve all of their strategic communications challenges – regardless of channel,” Lawson said in a statement.